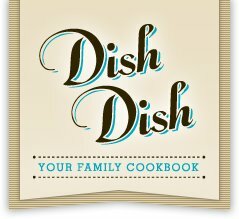 Dish Dish is an online website for organizing and sharing your recipes with friends and family. I asked founder Melanie Carr what makes Dish Dish unique to some of the other online recipe sites. "Dish Dish is unique in that free members have many more options, such as option to save recipes as either private or public, option to edit saved recipes and add their own photos or notes, and option to have unlimited recipes stored in their cookbook with a free account. Free members also have the ability to download their cookbook recipes as a PDF file to save on their computer and search anytime, even if they do not have internet access. For a “Pro Member” what I see as the biggest advantage is the ability to have us type in recipes for them, as this can be time consuming for some people; having the option to simply take a pic or send links to us by email or fax is an easy way to get their online cookbook jump started with 20 or 30 recipes (depending on whether they purchase the Pro Account or the Concierge Offer), to which they can easily add a recipe or two each week and quickly build their online cookbook database. I think the option to add multiple photos with recipes comes in handy especially with recipes that may be a bit complicated and would be made easier to understand by seeing photos of the recipe at various stages." So is so right about the advantage of having her put the recipes online for you! I was able to simply send a link or photo and she would get it all typed up and in my cookbook! For a busy mom that is so incredibly helpful. I don't have time to type up all of the recipes or I would have my own notebook full to use on hand. I have a large group of cookbooks, each probably having 3 recipes I utilize! What a space hoarder these cookbooks are! Plus I have to remember which cookbook the recipe is in that I needed. Dish Dish is a great storage place for all of my own personal recipes, but it also is a great place to find new recipes to try. Above is probably only 1/3 of my cookbooks that I need to go through and utilize Melanie's help in getting them loaded. I love that there is an app for Dish Dish a well. I am smart phone-less currently, but when I get it, that will be a bookmarked site that is used often! Melanie is very quick to get the recipes loaded for you as well. I have a couple pictures I need to get to her soon. With the busyness of summer I just hadn't had a chance to get too many to her. I love how I will be able to go to one place, to get every recipe I use! I asked Melanie what inspired her to start Dish Dish? "I was inspired to begin Dish Dish when I was looking for a way to easily store all my “favorite” recipes in one place, where I could find them easily (search by the name or term or ingredient), create my shopping list each week, and share quickly with friends and family. Instead, I had a cabinet full of post-it marked cookbooks, a large family cookbook, a folder with pages and pages of recipes gathered over the years from magazines, newspapers, friends, potlucks, and websites. Having my recipes all in one place, accessible from my laptop or tablet or mobile device any time, is perfect for me and I expected would be a great advantage for most any foodie or any mom who cooked meals at home regularly. Also, with some other sites you have to endure endless pop-ups or in-your-face ads for magazines or other sites while trying to manage your recipes. I wanted Dish Dish members to be able to avoid those frustrating ads and have a peaceful, welcoming site in which to organize and share their recipe cookbooks." One thing I love about Dish Dish is that you can try it out, set up your account and it is all free! If you realize (which you will!) that you LOVE it, then you can upgrade to a Go Pro account and get even more benefits. For only $19 a year, it definitely worth the upgrade! 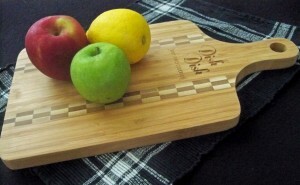 Enter for your chance to upgrade with a Go Pro account and also receive a gorgeous Bamboo Cutting board! I love the recipes. Can't wait to try the kale chips! The strawberry salsa would be amazing! I like the Tips of the Day and the Recipes. The Roasted Jalapeno Butter sounds interesting. Would be good on French bread. Would like to try their Cookie Pie recipe....sounds yummy! The chicken salad with apples and cranberries, and I love that they have a app! There "News" blog is well written. I liked their recipe search function. The whole concept is brilliant! Love that they have added a go-anywhere app for my phone.